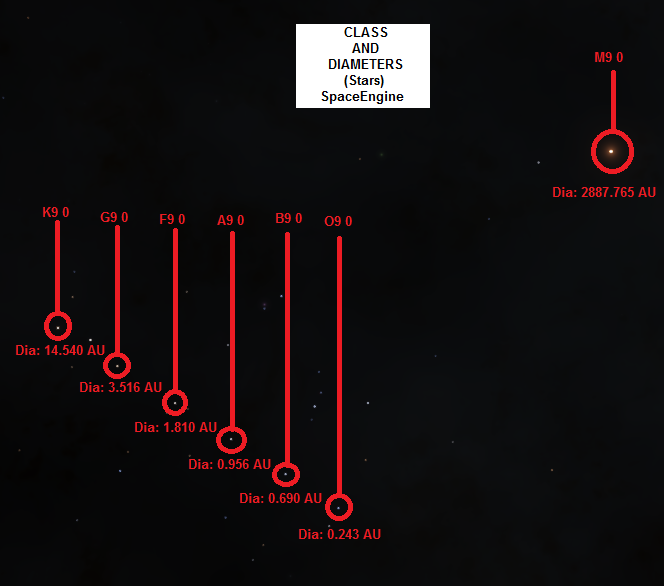 So out of curious jest I decided to create stars for the varying classes at their respective top-size points (Unless there are more settings I can tweak to go further, it seems that AppMagn .1 is the threshold for size). You can right-click and "View Image" to take you to the much larger photo's! 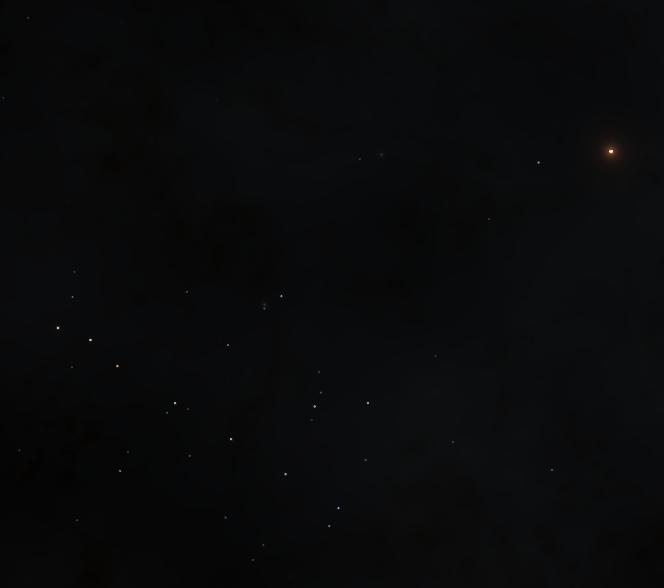 So this is from a staggering 979.31 kly from the Milky Way where the M9 0 class "Jeebus-M9" can still be seen! Close-up of the Goliath, coming in at a diameter of 2887.765 AU! The entire team in this photo! I included the diameters of the stars themselves and their respective classes above! Unmarked image for those that want it Some extra stars that are known are thrown into this! I prefer using Notepad++ when making this just for organization sake and tabbing! // Create a new object - star "Jeebus-M9"
// Create a new object - star "Jeebus-K9"
// Create a new object - star "Jeebus-G9"
// Create a new object - star "Jeebus-F9"
// Create a new object - star "Jeebus-A9"
// Create a new object - star "Jeebus-B9"
// Create a new object - star "Jeebus-O9"
Credit goes to the thread "MOD - Creating a Star" where SpaceEngineer wrote an incredibly detailed guide! 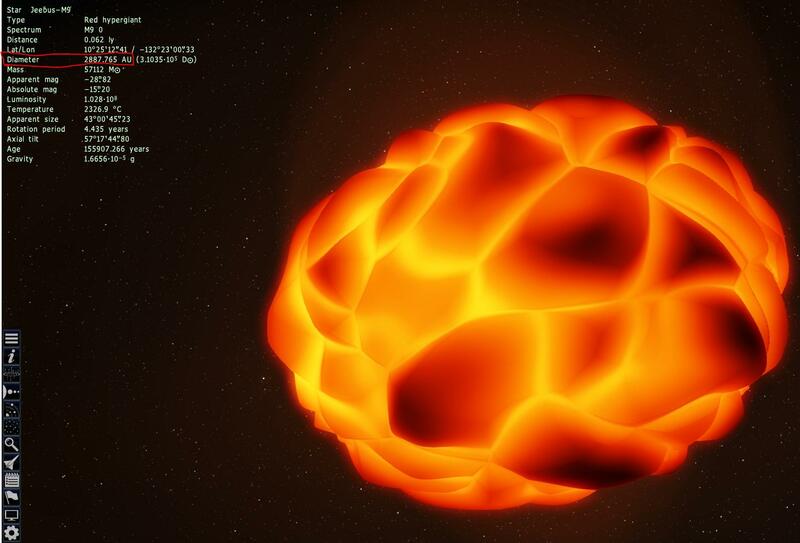 I am working on trying to create the smallest neutron star and largest black-hole. Those are not as detailed in making (as far as adjusting their size) and I would love for someone to show me some example code of black holes they've made or found! Why "9" Stars? Wouldn't 0 be better? That has nothing to do with size, it's the apparent brightness as seen from Earth. Numbers can be positive or negative with no limits. As the only value I am changing the difference between "M9 0" with an app mag of .1 vs -1 / -.1 is massive! 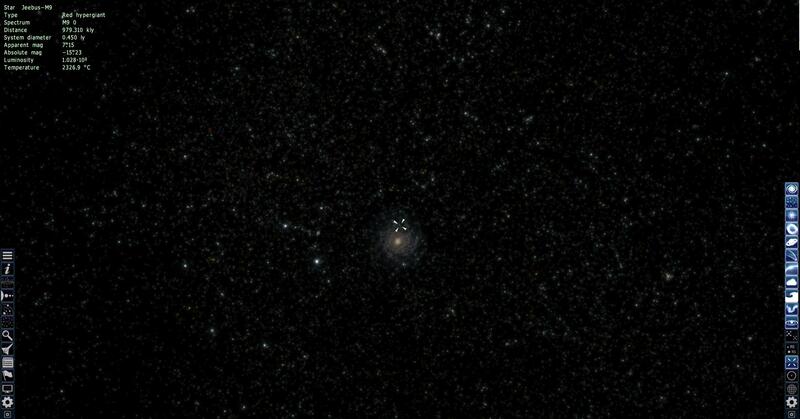 I did decide to jokingly do -50 and it caused a massive version of the magnitude to reflect the stars diameter to far beyond the Milky Ways size. I am not sure how the algorithm works but app mag is having an effect on the final render size of the star. I didn't want to mislead people into thinking that App Mag has an actual effect on a REAL stars size, but in SE, it does effect it. If you decrease the apparent magnitude of a star but keep its distance the same, then the star must be intrinsically brighter. Since you are also keeping the surface temperature the same (same spectral class), the only way it can be brighter is if it has a larger surface area. In case it's not obvious, you're generally going to end up with unrealistic stars if haphazardly changing the appmag value, for precisely this reason. If you're telling SE to make an M type star with an apparent magnitude of -50 (which is a billion times brighter than the Sun by the way -- Earth would be vaporized! ), but many light years from Earth, then of course it is going to be absurdly huge. You would be better off working in absolute magnitude, using an established range of abs mags that stars of a given spectral class can have according to an HR diagram. A wee bit off topic, I'm not fluent in this subject and am just wondering how would this work with say a galaxy several billion Ly away? Oh, fully aware and definitely know the settings I have are pretty unrealistic (maybe not in the grand scheme of things, but definitely from what we know of our universe)! I definitely agree completely with the purpose of apparent magnitude. I decided to toy with what you all have said about negative values and found (based on the M9 0) that after around -14.56 +/- that the star becomes an orange elliptical with no physical model. If I go to Earth and view that same star it will cloud the entirety of one part of the milky way in insane amounts of light. This is why I love this sandbox so much. Little tweaks and seeing how they generate in here is so much fun for me. Recently I put a black hole within 600K km from the SUN and it was entertaining to see it from other planets.